As you might have realised from my review of Sherlock’s memoirs, there was a period in time when I was struggling to sleep. It was as it reached about a week before I was due to return to work after my surgery and then magically stopped being an issue the very night I decided to quit. At least I can be grateful that a week filled with anxiety and unhappiness led to me having a chance to get a fair whack of reading done. 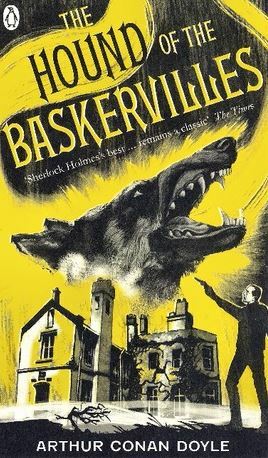 The Hound of the Baskervilles, the fourth book in the Sherlock Holmes series, is the first one of the books that I had not previously opened up and started reading which made it a little more exciting for me as it meant I knew there wouldn’t be that moment where some deep part of my mind was telling me what would happen next. Any assumptions or conclusions I was coming to would be based on nothing more than my own interpretation of events and that certainly made it feel like there was an increased number of twists, turns and reveals throughout this standalone mystery. Of all the mysteries that Watson has decided to enlighten us with this comes across as the darkest by far. The level of calculation that goes into causing terror amongst the suspected victim and all those living around the area is astounding and the deception that goes with it is of mastery level that unless, like Watson and Holmes, you are looking for it could very easily miss. At the end of it all, even though the reasons behind the mystery are solved, there are still a few questions left unanswered which can cause a little frustration but I found that it allowed myself as the reader to flesh out the ending in a way that suited me both (a welcome relief after the calculated attempts at murder described at the end of this recollection). Hearing about the death of the previous occupant of the family home, and many of those that came before him, and how it meant that there would be another person coming along to potentially face the same fate is naturally of interest to Holmes when the butler turns up at his door asking for assistance. Usually, when the adventure is based somewhere out of London the next thing we know is that Holmes and Watson are meeting at the train station to head out to solve it all, but in this case it starts that very evening and the following day in the capital city before venturing to the countryside. This use of multiple locations, a wider number of characters and having several subplots within the mystery (as well as some distractions from the real plot) really helps to bring the Holmes and Watson connection together and seems to make Conan Doyle come across as a stronger writer than he had previously managed. There is also a feeling, with Watson looking back on his notes with fondness, that there is a little more care and passion being put into the retelling of the story as it wants to appear like Watson is romanticising the past and his times with the world famous detective to do him justice against his big ‘failure’ that was previously announced to the world. I found The Sign Of Four, another of his other standalone books, to be very poorly written and lacking in enhancing description in comparison to The Hound Of The Baskervilles and if somebody didn’t want to read through books in order I would suggest that they choose this over that. This book has encouraged me to carry on reading my way through the series and I look forward to discovering how Conan Doyle continues to tackle this slight shift in relationship between the two. This entry was posted in Books, Culture and tagged Arthur Conan Doyle, book, book blog, book blogger, book bloggers, book review, Books, classic book, classic fiction, crime, fiction, hound of the baskervilles, murder, murder mystery, mystery, penguin book, Penguin Classics, read, reading, reading challenge, review, Sherlock Holmes, victorian, victorian fiction. Bookmark the permalink.